We round off our fixtures for 2018 with a home game in the Championship against Ayr United this weekend. The visitors were knocked off the top of the table by Ross County last weekend, but have enjoyed a spell at the top since our last meeting in Dumfries when we beat them five - nil. Gary Harkins scored along with four goals from Stephen Dobbie in the fantastic win. While we drew our game, one - all against them at Somerset Park with Connor Murray scoring our goal that day. Queens boss Gary Naysmith said "Last week's defeat at Alloa was a disappointing result for us. At both ends of the pitch, we were just below our normal standards and inevitably when that happens you will lose the match. It was our first defeat in seven games so there was no bawling and shouting at the players. It was more a case of just pointing out to them where we could have done better and making sure that we go into our next games in a positive frame of mind. When I analyse our games I always look for positives. We were nowhere near creative enough against Dunfermline in our last home game but we were much better at Alloa, we just didn't take our chances and their goal-keeper had three outstanding saves. It was definitely a missed opportunity as we have slipped out of the top four as a direct result of last weeks result. As it stands, We are nine points off third position but only three off fourth so there is a clear target for us to aim at. This weekends game is the start of a really challenging run for us. We've got three of the top four in the next three fixtures and then Dundee in the Cup. Ayr United have only lost twice in the league this season and will come to Palmerston having not lost in their last nine games, so we are well of aware of how difficult the game will be. They are where they are in the league for a reason, but with a win and a draw against them this season so far we are the team with the upper hand and we aim to continue that this weekend. 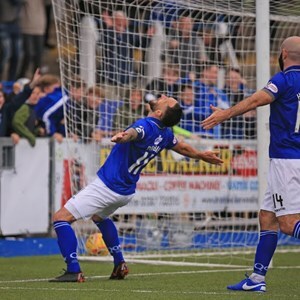 With Gary Harkins leaving the club earlier this week, we are still down in numbers but we are hopeful Stephen Dobbie will have recovered from his hamstring injury and will be available for at least some of the game this weekend". The game marks the start of the second half of the season, so Queens fans should note the half price season ticket offer kicks in. With the reduced prices, adults can now buy a book of tickets for the remainder of the season for £142.50. While an OAP/ Concessions season ticket now costs £80. Students and those aged between 16 and 21 can watch the next nine games, including the Ayr game for just £45. And of course our already value for money, Junior Blue ticket for the under 16's will now cost £9, that's just £1 a game. Visiting fans should note that sections six - nine in the BDS Digital (East) Stand have been set aside for Ayr Utd FC supporters. Turnstiles three and four will be in use. Separate catering outlet and toilets in the BDS stand will be available for use. Catering is also available in the Arena café where a full menu is available before kick-off. The bar under the Gates Stand will also be open for refreshments. Entry is by ticket only. The Arena ticket office will be open for away supporters from around half past eleven with the BDS Stand ticket offices opening about one o'clock. There is a slightly higher away crowd anticipated for this fixture that may cause some additional queuing. Spectators should arrive in plenty of time to ensure that they purchase their ticket and gain entry to the stadium for the kick off. Turnstiles open for admission at 2:00 p.m. There will be some on-street parking restrictions, therefore it is suggested that buses/minibuses drop off their passengers in Terregles St/King Street and thereafter park on College Mains road just off the roundabout with the A76 on the town bypass (adjacent to Curry's/PC World, as the other side at Aldi is the access road to the ambulance depot and is extremely busy). Pick up should be the same location. Car parking is available in the Arena car park, alternatively there is plenty of other on & off street parking available around the stadium. There are two sets of contraflow traffic works on the A76 that may affect traffic progress. No known roadworks around Dumfries that would affect travel times to Palmerston Park however fans should check the Traffic Scotland website at for confirmation and of any other delays. Palmerston Park is a non-smoking venue, this includes e-cigarettes and other such devices. Stewards are empowered to eject spectators who disobey these rules. No persons will be admitted to the ground who are deemed to be under the influence of alcohol. All spectators are required to abide by our acceptable behaviour policy.